Most horse owners are aware of the dangers of lush spring grass, but did you know that fall grasses can be just as harmful? Laminitis, or founder, is always harmful to our horses and can be triggered by the stressed fall grass. 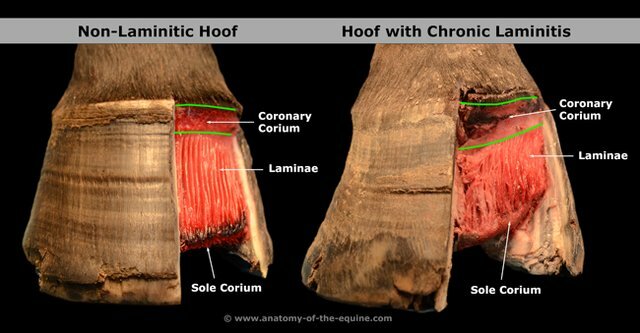 Laminitis is inflammation of the laminae in the horse’s foot. Lamina function to hold the coffin bone in place within the foot, so it’s understandable why damage to this sensitive tissue can cause so much discomfort. One of many causes of laminitis is ingesting grasses high in sugar. Most people are aware that rapidly growing grasses in the spring are very high in starch, and this source of energy is stored in the grass seeds. Energy can also be stored in the stem, root, and leaves as fructan. Later in the year, grasses are much more stressed because of the climate. They then mobilize starches and fructans to other portions of the grass that are more readily consumed during grazing (such as the stem). During colder temperatures, the sugar also can’t be utilized as fast as it is produced. The grasses are often sweeter and more attractive to hungry grazing horses. Short bursts of rain can also trigger grasses to grow more quickly for a short period of time which will make them richer in sugars. We also know that metabolic diseases (Pituitary Pars Intermedia Dysfunction, Equine Metabolic Syndrome, and Insulin Resistance) are more common than we realized, especially in aging horses. Horses with these conditions are often more sensitive to sugars and fructans. Luckily, metabolic testing in horses has grown by leaps and bounds so that we can identify these horses long before signs of laminitis or other secondary conditions are visible. Be sure to check out our guidelines for management of metabolic diseases in horses!